Brandon Wegher went undrafted out of tiny Morningside College, located in Sioux City, Iowa, where he rushed for 2610 yards on 327 carries and 39 TDs, –in one season. Wegher averaged an incredible 200.5 yards a game, en route to setting an NAIA single season rushing record. 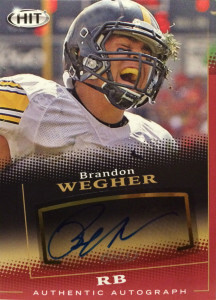 Wegher signed with the Carolina Panthers after the 2015 NFL Draft and then battled Cameron Artis-Payne and Jordan Todman for the 3rd string running back spot behind Johnathan Stewart and Fozzy Whittaker. During the preseason Wegher demonstrated many of the capabilities that the team looked for in an every down back, scoring 3 TDs during the preseason, and he became an endearing underdog favorite to Panthers fans. In the end Carolina kept Wegher over Todman, and were so afraid of losing him to another team, they signed him to the active roster. He dressed for one game in 2015, but did not see any action. In 2016, Brandon was among the final cuts coming out of training camp. Late in the year, he signed a futures contract with the Los Angeles Rams but in May of 2017 was cut. He currently is a free agent. I love this card. It has the right balance of just about everything you want from a portrait card. The photo is outstanding and that clump of grass in his helmet just says that Wegher isn’t afraid of getting down and dirty to get the extra yards.